The death of a Montreal woman who was mauled by an aggressive dog has prompted the city to seek a ban on pit bulls and other dangerous breeds. Montreal Mayor Denis Coderre announced Saturday that he will seek approval from city council this September to go ahead with a ban on new pit bulls that would apply across the city's 19 boroughs. But unlike Quebec City, where a ban will force owners to get rid of their pit bulls by January, Montreal plans to allow existing owners to keep their dogs under certain conditions. "I'm not comfortable to say that if we ban a breed, the current owners will have to get rid of their dogs, because you have good owners and you have good dogs, but it demands a balanced approach," Coderre said. Under his proposal, pit bulls and certain other breeds will have to be registered, spayed or neutered and wear a muzzle in public. Coderre said it remains to be seen whether dogs that are crossbred with pit bulls will fall under the legislation, but did mention that he believes they should. Several municipalities in Quebec are re-examining how they regulate dog ownership in the wake of the death of 55-year-old Christiane Vadnais, who was found dead in the backyard of her east-end Pointe-aux-Trembles home June 8. Police believe she was mauled by a pit bull. Her family has since been calling for a ban on the dogs. 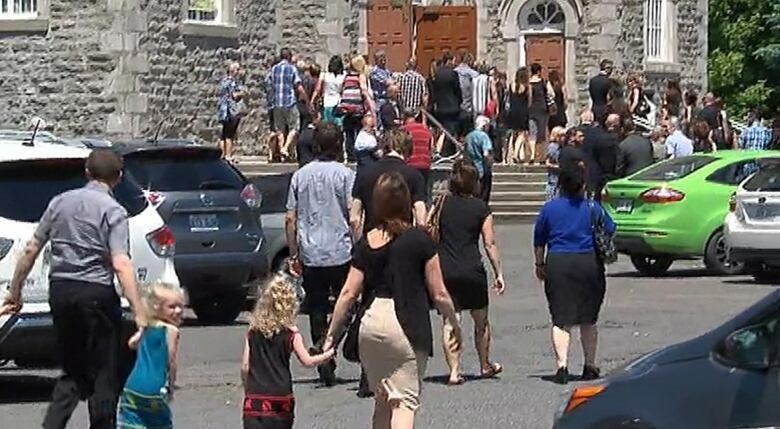 They gathered Saturday Saint-Cyrille de Wendover, near Drummondville, Que., for Vadnais's funeral. 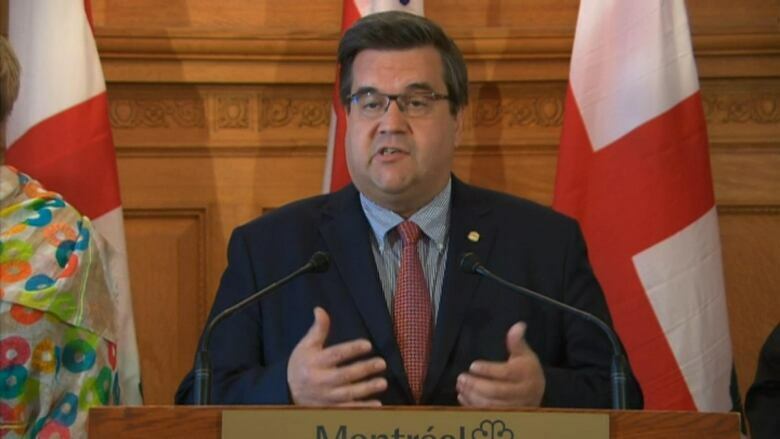 Montreal's planned legislation will be designed to deal with pit bulls in the short term while being broad enough to cover other types of dangerous dogs, Coderre said. "There is a situation regarding pit bulls that demands public authorities to take a stand," Coderre said. Coderre did not clarify how the city would define a dangerous dog, other than to say that pit bulls would be among the breeds singled out. Bites, tries to bite, attacks or tries to attack a person or another animal. While off its owner's property, manifests aggression towards a person or an animal by snarling, growling, showing its teeth, barking ferociously or acting in any way that suggests the dog may bite or attack. In the meantime, Coderre said the city will begin a publicity campaign to ensure dog owners are aware of their responsibilities. Dog owners are already supposed to register their animals with the city, but out of an estimated 145,000 dogs living in the city just under 14 per cent (20,123) are currently registered. Dog owners are also supposed to inform the city if their dog bites someone. Between 2014 and 2016, 637 dog bites were reported to the city. The city will hire more inspectors in order to increase patrols of the city this summer to ensure dog owners are respecting current municipal regulations. Montreal's SPCA criticized Coderre's proposal. They said it opens the door to banning specific breeds, which they say "supports the false premise that dogs that happen to look a certain way are inherently 'dangerous.'" The SPCA considers breed-specific legislation a form of discrimination. It warned that such policies could lead to the deaths of otherwise well-behaved dogs. "We are not going to let that happen here," Nicholas Gilman, the group's executive director, said in a news release. The SPCA said it is exploring options about how to prevent the ban from coming into effect, including legal challenges. "We know that the Montreal community understands that using hysteria, fear and prejudice as a means to push legislation forward is wholly unacceptable," said Alanna Devine, the Montreal SPCA's head of advocacy. Pit bull owners also expressed alarm at the regulations outlined by Coderre on Saturday. "I don't know how I feel about my pit bull having to wear a muzzle," Melissa Mira said in a comment on CBC Montreal's Facebook page. "We love to jog and play ball at the park... This is definitely going to affect our lifestyle..."
"It's the breed-specific part of it that is the problem," Truss said of the city's proposed pit bull ban. "You're essentially asking for a cull of all the pit bulls," he added. "That is really unfair because 99 per cent of them are really good dogs." ​Following her death, the province created a working group to review existing regulations surrounding pit bulls and come up with recommendations. The group met for the first time Thursday, but Premier Philippe Couillard has said Quebec will likely follow Ontario's lead and ban pit bulls across the province. The working group is expected to come up with a list of proposals by August. Coderre said Saturday that he didn't want to wait for provincial legislation before taking action against pit bulls.